As part of a core refresh, I had a pair of shiny new Nexus 93108TC-EX switches. 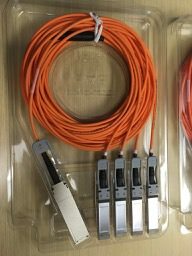 I needed to connect them to the old core switches using a QSFP to SFP+ breakout cable because the old switch didn’t have any 40Gb ports. I patched everything in and the transceivers looked fine, but when I turned up one of the 10Gb ports connected to the 40Gb ports it just started flapping. The port on the 40Gb side just says the bandwidth was 40000000 and it wasn’t breaking out the channels. I was not able to find any commands for it that were obvious in the CLI, so I start the Googling for the documentation. it took a bit longer to find than I thought it should, so thought I’d share it here to save you some time. So, turned out I was doing it wrong. Yeah, I know we already figured that out. (config)# interface breakout module 1 port 53 map ? So there you go. In this case, Ethernet 1/53 disappears and is replaced with Ethernet1/53/1 – 4. I hadn’t expected that parameter to be in the global config and had been expecting to find it in the interface configuration. You may now enjoy the full benefit of your breakout cables. This entry was posted in Cisco and tagged cisco, nexus by scottm32768. Bookmark the permalink.